Kezia Dugdale has claimed that a magazine revealed she was gay without her consent. The former Scottish Labour leader, who stepped down on Tuesday, told the Victoria Derbyshire Show on BBC that an interview published in April 2016 in the Fabian Review disclosed her sexuality - despite her wishes that it not be reported. Ms Dugdale said: “I didn’t have complete control over coming out - it was really difficult. “I came out in the middle of an incredibly intense election campaign [the 2016 Scottish parliament elections]. I’d done an interview with a publication, I’ve done hundreds of interviews with journalists. 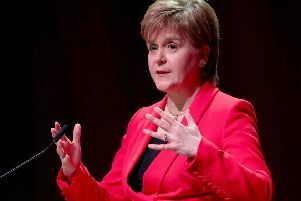 Ms Dugdale, who was speaking as part of a film made by SNP MP Hannah Bardell about politicians and their experiences of coming out, added: “I would always answer honestly and say I would prefer you wouldn’t use that. The article made reference to Ms Dugdale’s now-former partner. The Lothian MSP is currently in a relationship with SNP MSP Jenny Gilruth. In the article, Ms Dugdale is quoted as saying: ”I have a female partner. I don’t talk about it very much because I don’t feel I need to. And there’s something too about how meteoric my career has been. “I am generally calm, almost serene. I don’t get easily stressed or battered. But I need a bit of stability to do that, and that means my private life is my private life. The journalist who wrote the article, Mary Riddell, told the BBC: “At no point during the interview or afterwards did [Ms Dugdale] ask me not to publish her comments, which were recorded with her agreement. A statement from the Fabian Society said: “We are very sorry that Kezia Dugdale was upset by the interview that appeared in the Fabian Review in 2016. Tory minister Sir Alan Duncan also told the programme that his sexuality led to him being blocked from becoming a whip during John Major’s government. The Foreign Office minister said he was ‘blackballed from the whip’s office’ by people ‘who thought it would be too high-risk’.